12 Things Good Bosses Believe by Robert I. Sutton – “My success – and that of my people – depends largely on being the master of obvious and mundane things, not on magical, obscure, or breakthrough ideas or methods.” [I think this is so true. Ever manager should repeat this over and over every day until they give the boring details the attention it deserves over the flashy stuff – John]. Trust Your Staff to Make Decisions by John Hunter – When managers don’t trust that their systems hire and keep people that will make good decisions they sometimes chose not to give their staff any authority. That is a bad idea. The solution is to manage your systems so that you can trust people to make good decisions. 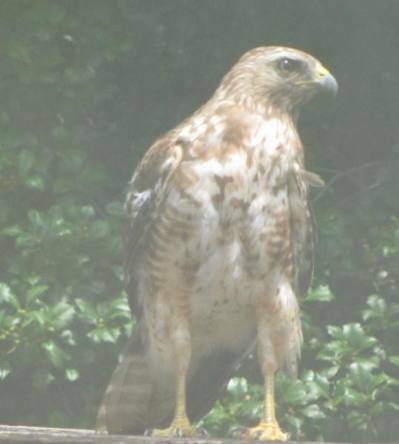 I took the photo of Red shouldered hawk, looking out the window from my home office. This entry was posted in Carnival, Management and tagged management on July 1, 2010 by John Hunter. Thanks for including my post, John. It's quite fine, the company you've put me in. Thanks for the inclusion in this Carnival! Nice pic of the hawk as well. I had a red tail hawk sitting on top of my mail box post the other day. Thanks for the inclusion, and I look forward to hosting the next installment of the Management Improvement Carnival.